Introduction: Natural products can be more active than we consider them. Some herbs used by man can boost the body’s antioxidant level. This herb that serves as vegetable have also been identified as a cure some illnesses and also restore the integrity of the organs of the body. Objective: This research investigated the efficacy of as a natural antioxidant for reducing toxicity. Materials and Methods: Twenty five (25) rats with average weight of 145 g were randomly assigned into five groups and received standard rat’s diet and allowed water ad libitum. Group A (negative control) received normal saline. Group B and C received Lead acetate solution (1.5 mg/kg) in addition to the extract serving as low and high dose groups respectively. Group D (positive control) received Lead acetate solution only while group E was given ethanolic extract only to ascertain if it has any deleterious effects. Results: The animals showed an increase in both the body, uterine and ovarian weight when compared to group D. The SOD activity reduced in both B and C while increasing in D but E had a normal SOD level. On examination of the ovary and uterus microscopically, the alterations seen in the photomicrophic plates includes damages and reduced folliculogenesis with a marked increase in the number of atretic follicles, oedema, necrotic zones, etc. These changes were restored to near normal following the administration of the extract. Conclusion: The finding of this research shows that natural products are capable of removing oxidative radical produced in the body thereby detoxifying the body and reproductive organs. The female reproductive system and human fertility is adversely affected by exposure to environmental toxicants. In this regard, much attention has been paid to toxic environmental factors that cause ovarian toxicity and there have been some attentions on toxic environmental factors that cause both ovarian and uterine toxicity [1-3]. According to Sullivan  “we know of relatively few chemicals that have adverse effects on reproduction but we are ignorant of more than 90% of industrial chemicals to which people are exposed”. Reproductive toxicity is the adverse effects of chemicals on gonadal structures and functions, alterations in fertility and impaired gametes functions [5-8]. Infertility as a common problem affects perhaps one in every six couples . A number of studies have suggested that male problems is the commonest single known cause of infertility even though diagnostic problems make it difficult to establish the extent to which the females are involved . The use of plant extract as fertility booster in human is now on the increase because of the shifting of the attention from synthetic drugs to natural plant products . Accessibility, availability and affordability are some of the factors that have prompted over 80% of the populace in the developing countries to continue using medicinal plant products in handling primary medical problems . In the African continent, various plants have been identified to pose fertility regulating properties and quite a few of them have been tested and proven for such effects [13- 16]. This informed the need to test F. vogelii a woody tree or shrub in the family Moraceae  in treating the reproductive organs. This tree is called “figs tree” in English. The fruit of most other species are also edible though they are usually of only local economic importance or eaten as bush food . The leave of F. vogelii is used locally as vegetables. The Igbos refers to F. vogelii as ogbu. This research is aims at investigating the role of F. vogelii as an antioxidant in reducing toxicity. The plant material was collected from Enyibichiri Ndufu-Alike in Ikwo Local Government Area of Ebonyi State where it grows in abundant and used by the inhabitants as vegetable. The leaves were washed and dried in ventilated room. Thereafter, it was crushed into powder using pestle and mortar and passed through mesh sieve to get the fine powder which was divided into portions ‘A’ and ‘B’. Portion ‘A’, five hundred grams (500 g) of the powder was weighed using an electronic weighing balance and soaked in 1200 mL of ethanol (powder/solvent) respectively. The mixture was agitated using an electric blender to enhance proper mixing of the solvent with the powder and then poured into air-tight plastic container. The container, with the mixture was kept in the refrigerator for 48 hours. The mixture was filtered, first, with cheese cloth, and then with Whattman No 1 filters paper (24 cm). The filtrates were separated and concentrated in vacuum using Rotary Evaporator to 10% of their original volumes at 37°C-40°C. This was heated to dryness using water bath. This was stored until it was required for use. The phytochemical screening was perform using 500 g of the powder representing portion ‘B’ of the extract. This portion was subjected to quantitive phytochemical screening using the method described by Prashant, et al. . The ethical approval for this work was sort and obtained from the Ethical Committee of the Faculty of Basic Medical Sciences, University of Nigeria Nsukka, Enugu Campus (UNEC). There was a strict adherence to International Guidelines for the use of animals in research studies based on European Commission Directive on the use of animals . There twenty five (25) female Wistar rats with average weight of 145 g was procured and maintained in the Animal House of Anatomy Department of Faculty of Basic Medical Sciences of the University of Nigeria, Enugu Campus (UNEC). The animals were housed in netted cages, fed with grower’s mash and allowed water ad libitum with acclimatization period of one week (7 days) was observed. There were randomly assigned into five groups (A, B, C, D and E). The rats received standard rat’s diet containing 0.5% NaCl, 16.8% protein and 46.5% dietary fat, 35.7%, vitamins, other micro nutrients and tap water ad libitum , throughout the period of the study. Group A served as negative control and received normal saline to expose them to the sane stress as the other groups. Groups B and C received 1.5 mg/kg Lead acetate solution daily  and 24 hours later ethanolic extract of F. vogelii was administered. Group B served as the low dose group and received 100 mg/ kg of the ethanolic extract while C served as the high dose group and received 300 mg/ kg of the ethanolic extract. Group D served as the positive control group and received Lead acetate solution. The rats in this group received 1.5 mg/kg of Lead acetate solution . Group E received only the aqueous extract of F. vogelii and it serves to ascertain if the extract has any deleterious effects in the rats (Figure 1). After the experiment one of the ovaries was harvested and homogenized with mortar and pestles  and then preserved with phosphate buffer. The preserved homogenate was centrifuged and kept under refrigeration overnight before it was sent to a laboratory for antioxidant check. Superoxide dismutase activity was measured according to the method of Rukmini et al. as described by Winterboun et al. . The principle of the assay was based on the ability of SOD to inhibit the reduction of nitro-blue tetrazolium (NBT). Briefly, the reaction mixture contained 2.7 ml of 0.067 M phosphate buffer, pH 7.8, 0.05 ml of 0.12 mM riboflavin, 0.1 ml of 1.5 mM NBT, 0.05 ml of 0.01 M methionine and 0.1 ml of enzyme samples. Uniform illumination of the tubes was ensured by placing it in air aluminum foil in a box with a 15 W fluorescent lamp for 10 minutes. Control without the enzyme source was included. The absorbance was measured at 560 nm . One unit of SOD was defined as the amount of enzyme required to inhibit the reduction of NBT by 50% under the specific conditions. At the end of the experiment, the rats were starved overnight and anaesthetized with chloroform and then decapitated by Schoenwolf et al. . The animals were sacrificed, dissected then the uterus and ovary removed, weighed and quickly fixed in bouin’s fluid for routine histological procedures. The tissues were processed and embedded in paraffin wax to obtain thin sections. The Data were analyzed using descriptive statistics and presented as mean ± standard error of mean (SEM). Inferential statistics of paired student’s t-Test was adopted and the statistical significance level was established at a value of P ≤ 0.05 (*) or P ≤ 0.01 (**) with the aid of statistical software package (SPSS) version 20. The results such as weights, SOD activities, and the histological studies are summarized below in tabular form, charts and photomicrographs. 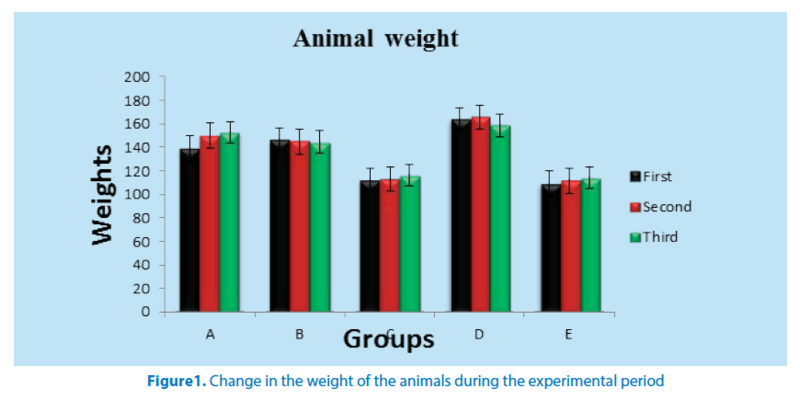 Table 1 shows weight change of the animals that received aqueous extract of F. vogelii. During the experiment, group A showed significant increase in weight at P ≤ 0.05 and P ≤ 0.01 in second and third weeks respectively. Group D recorded weight loss in the second week but a significant reduction in third week. There was a progressive weight loss in group B but only significant in third week. 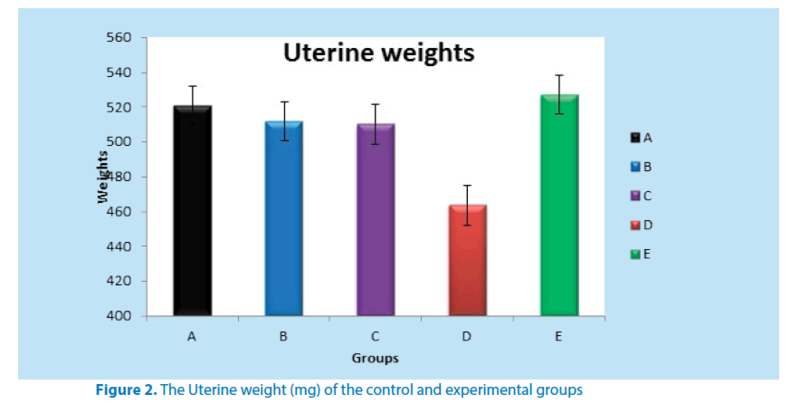 Table 2 below shows the mean weight of the uterus in both the control and experimental groups. Group D when compared to group A recorded a significant weight loss in their uterine weight as shown in the table below. All the other groups when compared to group D (positive control) showed a statistically significant uterine weight gain (Figure 2). Table 3 below shows the mean weight of the ovary in the control and experimental groups. 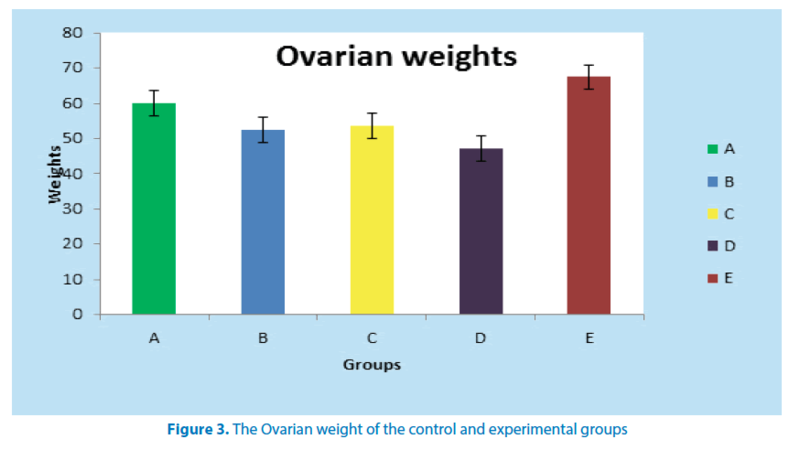 As shown, group D (positive control) recorded a significant ovarian weight loss (P ≤ 0.01) when compared to normal control (group A). All the other groups when compared to group D (positive control) showed a statistically significant (P ≤ 0.01) ovarian weight gain (Figure 3). The SOD results as presented in Table 4 below shows that positive control (group D) have a significant increase in SOD activity when compared to the negative control (group A). The currative groups showed reduction in SOD activity level but not statistically significant when compared to the positive control (group D). The following chemicals were screened for and the results are as presented below in Table 5. 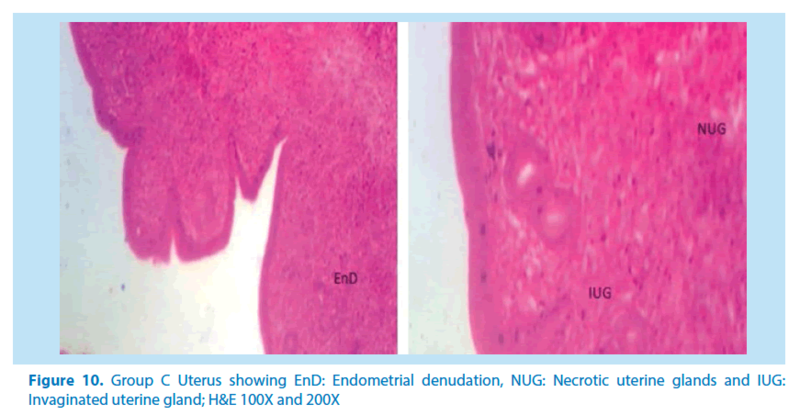 The main histological alterations observed in female rat ovaries and uterus after inducing toxicity with lead acetate solution and treating with aqueous and ethanolic extracts of F. vogelii are presented below as they appear in H&E stain, 60X and 150X. The wake of 21st century gave rise to the recognition of herbal medicine more than ever and F. vogelii is a vegetable that has been used locally to treat some illnesses and also implicated by so many researchers as an herbal remedy for some human diseases . The positive change in body weight in any research is a useful indicator of favourable effect of herbal medicine [30,31] and is also an important constituent in the study of safety of any therapeutic agent . In this research, the animals in negative group recorded a significant increase in body weight in the second and third week at P ≤ 0.01 and P ≤ 0.05 respectively while lead acetate group showed an little weight increase in the second week and a significant weight loss in the third week agreeing with Dumetrescu et al. . The little increase in weight might be due to the fact that lead needed time to cause enough damage that could lead to weight loss, while the subsequent weight loss could have resulted from the deleterious effect of lead on the organs at this stage. Among the experimental groups some showed a significant increase in body weight at P ≤ 0.05 in the second week while others showed significant increase at P ≤ 0.01 in the third week. The increase in weight is one of the major pointers that the leave of F. vogelii has a nutritive and therapeutic value. The significant (P ≤ 0.01 and P ≤ 0.05) decrease in the uterine and ovarian weights of the animals in positive control group agrees. The above findings agree with the report of Durgesh and Lata,  where they stated that “the animals that received only lead acetate experienced a significant reduction in uterine weight.” The extract group only recorded a significant (P ≤ 0.01) uterine and ovarian weight gain compared to the negative control group. This organ weight gain could be an insight into the therapeutic benefits of extract. 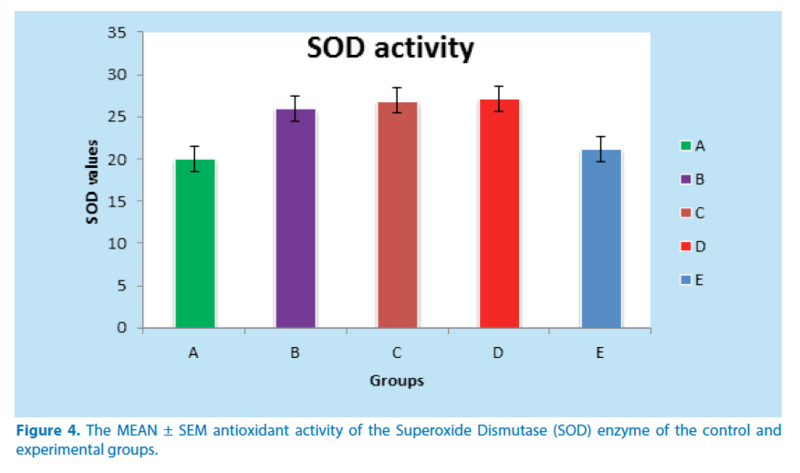 As shown in Table 4 above, positive control group showed a significant (P<0.01) increase in superoxide dismutase (SOD) assumed to be as a result of the inflammation caused by the induced toxicity compared to the negative control group. The rats treated with the extract recorded a decrease in ovarian SOD when compared to that of the positive control group. The group that received only the extract showed SOD closer to the negative control which might be a pointer that F.vogelii is a good antioxidant capable of removing free radicals produced due to inflammation by the presence of toxins. These free radicals cause SOD level in the body to rise above normal  (Figure 4). Figure 4. The MEAN ± SEM antioxidant activity of the Superoxide Dismutase (SOD) enzyme of the control and experimental groups. After a quantitative phytochemical screening of the ethanolic extract, the following chemicals were present: saponins, flavonoids, alkaloids, triterpenoids, polyphenols, coumarins, steroids, carotenoids and cardiac glycosides. Various phytosteroids (plant steroids) have been shown to promote fertility [36,37]. Flavonoids present in the leave of plants have been shown to possess many pharmacological properties such as: anti-oxidant activities, anti-inflammatory activities, anti-cancer activities and anti-microbial effects. This is in agreement with the work done by Uche and Obianime . Flavonoids might have contributed to the extracts healing (anti-inflammatory) properties as observed from the histological studies [39,40]. F. vogelii is very rich in triterpenoids, a compound which plays a very active role in wound healing . According to Krishnaiah et al. , triterpenoids are shown to strengthen the skin, increase the concentration of antioxidants in wounds, and restore inflamed tissues by increasing blood supply (Figures 5-8). 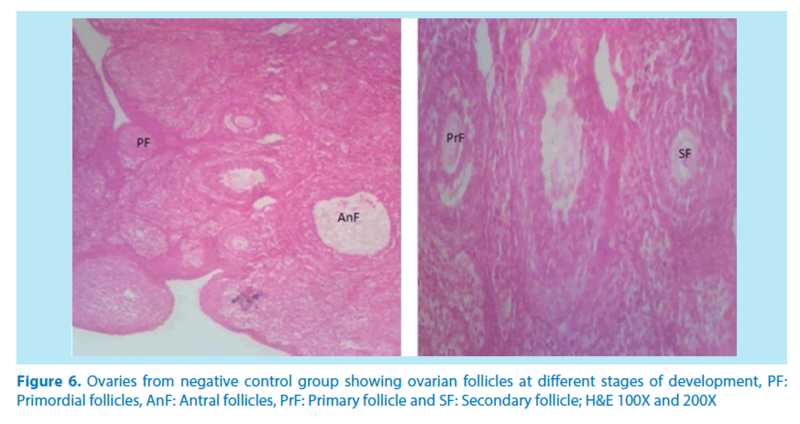 Microscopical examinations of various parts of the ovary and uterus for histological alterations showed numerous damages and reduction in the formation of follicles with a marked increase in the number of atretic follicles which is in agreement with Igile et al. , Patrick  and Junaid et al. . The major structural changes in the organs (ovaries and uterus) include diffuse oedema, necrosis, optical empty spaces, denudation, folliculogenesis and atretic follicles in accordance with Durgesh and Lata, , Taupeau et al. and Dumetrescu et al. . The organs also looked more vascularized the extract groups which indicated a restoration in the blood supply to the organs that was lost due to the lead induced toxicity. According to Shah et al. , oral administration of high doses of lead, leads to reduced number of ovarian follicles and an increased number of atretic follicles as was also observed in this study. The effects of lead on reproductive systems of female rats are complex as seen in this study. The uterus of animals in negative control group presented a normal endometrium, intact uterine glands and unaltered stroma in agreement with Dumetrescu et al. report of 2005. The ovaries also showed normal histoarchiteture with ovarian follicles at various stages of development. Ovaries of the animals that received only lead acetate presented a fatty change (a reversible change that occurs in organs due to toxicity) appearance and focal loss of tissue (optical empty spaces) . This fatty change occurred in the organ due to toxicity. The damage might be as a result of the lead effect on blood vessels leading to tissue necrosis. Lead also interferes with several enzymatic steps in the haem pathway . The above changes were also reported by Dumitrescu et al. and Dumetrescu et al. . The animals in experimental groups showed particularly an interesting observation about the dynamics of reactions to the presence of extract in their systems. The ovary of low dose of the extract showed some developing follicles with evidence of lead poisoning shown by fatty changes. The uterus has little damaged areas which might be due to the healing effect of the extract in the body against the toxicity induced by the lead acetate . The antioxidant property of the extract is implicated in the control or prevention of inflammation. The granuloma (a disease condition due to inflammation or infections) formed is not pronounced. The higher dose engendered folliculogenesis as evidenced in the ovaries. The oedema and denudations observed were not as prominent as in the low dose group. The uterine glands were better healed than those in the low dose group. There was a marked increase in the perfusion of the organs (ovary and uterus) which might be due to the extracts ability to restore the blood supply to the organs (Figures 9-12). Figure 9. Group C Ovary showing TL: theca lutea, AnF: Antral follicle and IC: interstitial cells; H&E 100X and 200X. Figure 11. Group D Ovary showing OES: optical empty spaces; PF: primordial ovarian follicles; OFD: ovarian follicle denudation; DO: diffuse oedemas; OFN: Ovarian follicles necrosis; F: Follicles at different stages of development; H&E 100X and 200X. Figure 12. Group D Uterus showing NZ: Necrotic zone, UG: Uterine glands, NUG: Necrotic Uterine Gland and EnD: endometrial denudation; H&E 100X and 200X. In summary, our results demonstrated that of F. vogelii leaves are very good as an alternative herbal medicine. Reproductive toxicity of lead in female rats can be reversed to normal using this extract and there was in the free radicals by the antioxidant by interfering with the reactive oxygen species produced by lead toxicity as evidenced by the reduction in the ovarian SOD in Table 4 above. We also discovered that the extract suppressed and healed the damages caused on the tissues confirming its effectiveness in the treatment of reproductive organ alterations (Figures 13 and 14). Figure 13. Group F uterus showing N: Normal mucosa, LP: Lamina propria, CA: Coiled arteries and M: Myometrium; H&E 100X and 200X. Figure 14. Group F ovary showing SF: Secondary follicle, AnF: Antral follicle, PF: primordial follicles and IC: Interstitial cells; H&E 100X and 200X. Hruska KS, Furth PA, Seifer DB et al. Environmental factors in infertility. Clin. Obstet. Gynecol. 43(4), 821-829 (2000). Brunton LL, Goodman LS, Blumenthal D et al. Principles of toxicology. McGraw-Hill Professional (2007). Casarett LJ, Doull J, Klaassen CD. Casarett and Doull's toxicology: the basic science of poisons. McGraw-Hill, New York (2008). Sullivan FM. Impacts of the environment on reproduction from conception to parturition. Env. Health. Perspec. 101(2), 13-18 (1993). Hodge AT. Roman aqueducts & water supply. Bristol Classical Press (2002). Timbrell J. Introduction to toxicology. CRC Press (2001). Brent J, Wallace K, Burkhart KK et al. Critical care toxicology: diagnosis and management of the critically poisoned patient. Gulf Professional Publishing (2005). Kosnett MJ. Heavy metal intoxication and chelators. Basic and clinical pharmacology. McGraw-Hill, New York (2007). Oladimeji SO, Igbalaye JO, Coleshowers CL. Immunological biomarkers determined in female rats administered with pro-fertility extract of Anthocleista vogelii. J. Nat. Sci. Res. 4(8), 113-122 (2014). Van den Eede B. Investigation and treatment of infertile couples: ESHRE guidelines for good clinical and laboratory practice. Hum. Reprod. 10(5), 1246-1271 (1995). Dada AA and Ajilore VO. Use of ethanol extracts of Garcinia kola as fertility enhancer in female catfish Clarias gariepinus broodstock. Int. J. Fish. Aquacul. 1(1), 005-010 (2009). Watcho P, Ngadjui E, Alango NP et al. Reproductive effects of Ficus asperifolia (Moraceae) in female rats. Afr. Health Sci. 9(1), 49-53 (2009). Baker DA, Hameed C, Tejani N et al. Lymphocyte subsets in women on low dose oral contraceptives. Contraception 32(4), 377-382 (1985). Telefo PB, Moundipa PF, Tchouanguep FM. Oestrogenicity and effect on hepatic metabolism of the aqueous extract of the leaf mixture of Aloe buettneri, Dicliptera verticillata, Hibiscus macranthus and Justicia insularis. Fitoterapia. 73(6), 472-478 (2002). Ganguly M, Borthakur M, Devi N et al. Antifertility activit y of the methanolic leaf extract of Cissampelos pareira in female albino mice. J. Ethnopharmacol. 111(3), 688-691 (2007). Cherdshewasart W, Nimsakul N. Clinical trial of Butea supeba, an alternative herbal treatment for erectile dysfunction. Asian. J. Androl. 5(3), 243-246 (2003). Berg CC, Corner EJH. Moraceae. In: Flora Malesiana Ser. 17(2), (2005). Egbuna PAC, Joshua PE, Chigbo MU. Anti-hepatotoxic effects of ficus vogelii ethanol leaf extract on the liver function indices of Ccl4–induced hepatotoxicity in rats. J. Am. Sci. 7(6), (2011). Tiwari P, Kumar B, Kaur M et al. Phytochemical screening and extraction: a review. Int. Pharm. Sci. 1(1), 98-106 (2011). European Commission. Directive 2010/63/EU of the European parliament and the council on the protection of animals used for scientific purposes. Brussels, Belgium (2010). Krinke GJ. The laboratory rat. Academic press, New York (2002). Dafalla HAA. Studies on the constituents of Ficus capensis (Thumb). Pak. J. Soc. Sci. 3(5), 751-754 (2005). Benoff S, Auborn K, Marmar JL et al. Link between low-dose environmentally relevant cadmium exposures and asthenozoospermia in a rat model. Fert. Ster. 89(2), 73-79 (2008). Akunna GG, Saalu LC, Ogunlade B et al. Consumption of bay leaf (a food spice) may be a safe and effective treatment for male infertility resulting from partial ligation of the left renal vein in wistar rat: study suggest. Am. J. Res. Comm. 1(3), 123-142 (2013). Rukmini MS, D'souza B, D'souza V. Superoxide dismutase and catalase activities and their correlation with malondialdehyde in schizophrenic patients. Ind. J. Clin. Biochem. 19(2), 114 (2004). Winterbourn CC, Hawkins RE, Brian M et al. The estimation of red cell superoxide dismutase activity. J. Lab. Clin. Med. 85(2), 337-341(1975). Adenuga GA, Adegbesan BO, Adebayo OL. Antioxidant defense of zinc acetate supplementation on the brain of protein–undernourished rats. Int. J. Biol. Chem. Sci. 3(1), 152-155 (2009). Schoenwolf GC, Bleyl SB, Brauer PR et al. Larsen’s human embryology. Elsevier (2015). Igile GO, Utin IC, Iwara IA et al. Ethanolic extract of Ficus Vogelii ameliorates dyslipidemia in diabetic albino wistar rats. Int. J. Curr. Res. Biosci. Plant. Biol. 2(8), 87-96 (2015). OA, Al-Shabanah, El-Hadiyah TM et al. Effect of prolonged vigabatrin treatment on hematological and biochemical parameters in plasma, liver and kidney of Swiss albino mice. Sci. Pharm. 70(2), 135-145 (2002). Alli LA, Oluwole OP, Aniah JA et al. Histopatologic effects of aqueous root extract of Acacia nilotica on rat liver, kidney and lungs. J. Anatomical. Sci. 6(1), 12-18 (2015). OECD. The OECD guideline for testing of chemical usage in experiment. The organization of economic co-operation development. Paris (2001). Dumitrescu E, Chiurciu V, Muselin F et al. Effects of long-term exposure of female rats to low levels of lead: ovary and uterus histological architecture changes. Turkish. J. Biol. 39(2), 284-289 (2015). 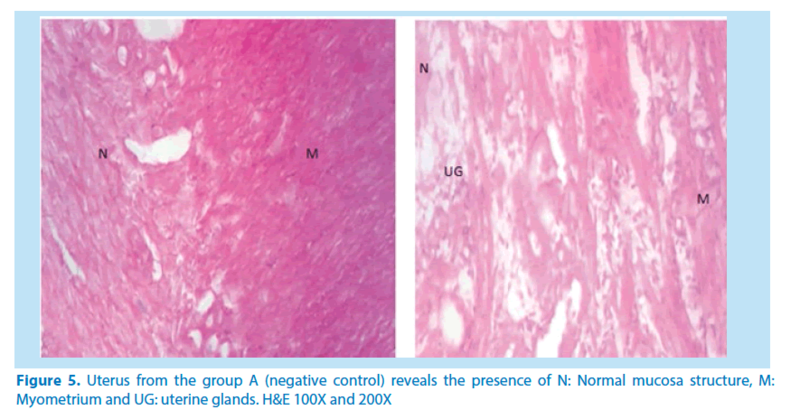 Sharma DN, Bhattacharya L. Role of Vitamin E on anti folliculogenesis effects of lead acetate on diameter of follicles containing ovarian tissue of swiss albino mice. Global. J. Biol. Agri. Health. Sci. 3(1), 322-325 (2014). Sirisha N, Sreenivasulu M, Sangeeta K et al. Antioxidant properties of Ficus species-a review. Int. J. Pharm.Tech. Res. 2(4), 2174-2182 (2010). Ruiz-Luna AC, Salazar S, Aspajo NJ et al. Lepidium meyenii (Maca) increases litter size in normal adult female mice. Rep. Biol. Endocrinol. 3(1), 16 (2005). Iwara IA, Igile GO, Uboh FE et al. Hypoglycemic and hypolipidemic potentials of extract of vernonia calvaona on alloxan-induced diabetic albino wistar rats. Eur. J. Med. Plants. 8(2), 78-86 (2015). Uche FI, Obianime AW. The effects of Vitamin E on Vanadium Pentoxide toxicity of the biochemical parameters of male guinea pigs. J. Appl. Sci. Env. Manag. 12(3), 101-105 (2008). Okwu DE, Josiah C. Evaluation of the chemical composition of two nigerian medicinal plants. Afr. J. Biotech. 5(4), 357-361 (2006). Uche FI, Obianime AW, Gogo-Abite M. Effects of vanadium pentoxide on the histological and sperm parameters of male guinea pigs. J. Appl. Sci. Env. Manag. 12(3), 107-115 (2008). Sotheeswaran S, Doyle M, Aalbersberg W. Medicinal plants in the south pacfific.WHO Regional Publications. Philippines (1998). Krishnaiah D, Devi T, Bono A et al. Studies on phytochemical constituents of six Malaysian medicinal plants. J. Med. Plants. Res. 3(2), 067-072 (2009). Patrick L. Lead toxicity part II: The role of free radical damage and the use of antioxidants in the pathology and treatment of lead toxicity. Altern. Med. Rev. 11, 114-127 (2006). Junaid M, Chowdhuri DK, Saxena R. Lead-induced changes in ovarian follicular development and maturation in mice. J. Toxicol. Env. Health. 50(1), 31-40 (1997). Taupeau C, Poupon J, Nomé F et al. Lead accumulation in the mouse ovary after treatment-induced follicular atresia. Reprod. Toxicol. 15(4), 385-391 (2001). Dumitrescu E, Cristina RT, Muselin F. Reproductive biology study of dynamics of female sexual hormones: a 12-month exposure to lead acetate rat model. Turk. J. Biol. 38(5), 581-585 (2014). Shah A, Mian M, Khan S et al. Correlation of blood lead levels with atresia of ovarian follicles of albino mice. Ann. Pak. Inst. Med. Sci. 4, 188-192 (2008).